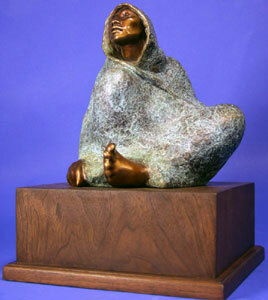 Shirley Thomson-Smith, Hopi Maiden, Bronze Edition of 25, 20" x 15" x 14"
One day when she was in her late 40s, Shirley Thomson Smith simply walked away from her job as a secretary for a food wholesaler. She despised the work, which required intense concentration and precision, and it certainly didn't help that she was, as she puts it, "a terrible secretary." She had no income other than a year's worth of alimony coming from her ex-husband, but she promised herself that she would become an artist within a year or die trying. "I was scared to death," she recalls. "I don't know where the courage came from except that my art was beckoning." 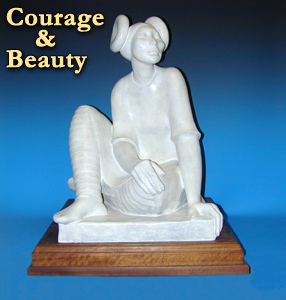 Shirley Thomson-Smith, Adrift, Bronze Edition of 35, 10" x 10"
Courage and confidence are persistent themes for the 71-year-old artist. Many times she has stared down fear or been startled by the praise of others, thereby forced to look at her own work through their eyes, only to be reminded of the importance of self-worth. She was raised in an era when women's efforts were not valued, and she fought that bigotry most of her adult life-sometimes believing she was equal, sometimes not. This struggle to achieve self-confidence is obvious in her sculptures, which largely depict women in poses of meditation, defiance, repose, and lofty pride. Smith especially enjoys sculpting Native American and African American women, for reasons she cannot easily explain. "It's almost like they've got to come out of me," she says. 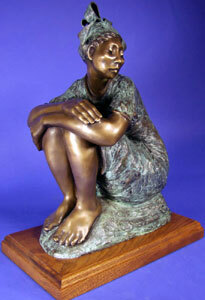 Shirley Thomson-Smith, Camilla, Bronze Edition of 20, 20" x 16" x 9"
Born in St. Louis, Smith moved to Oklahoma City when she was 5 and has remained there her entire life, except for a brief stint in Durango, CO. Both she and her older brother were artistic as children, but her brother received the lion's share of parental support for his talent. For her part, Smith designed paper-doll clothes and drew constantly, developing a skill for replicating the human figure. She dreamt of a time when she would make a lot of money as a fashion illustrator. Although she was not a strong student, she blossomed in her art classes. She vividly remembers her high school art teacher, Mrs. Terry, with her lustrous, long red fingernails and her warm enthusiasm for Smith's artwork. Terry was the first of many teachers who nurtured her growth as an artist. 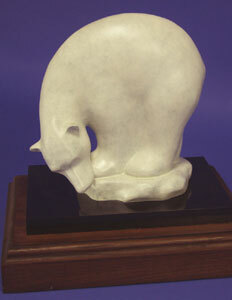 Shirley Thomson-Smith, My Sister, Bronze Edition of 30, 10" x 10" x 9.5"
Drawing was tossed by the wayside, however, once she took her first sculpture class at Oklahoma University. She hasn't drawn since-not even a sketch in preparation for making a sculpture. "I laughingly say that I was playing with mud pies," the artist says of her early efforts at sculpture. "I had this fascination. I couldn't hardly leave it alone. I loved water-based clay that I could move around much more than oil-based. And every art teacher I ever had saw things in me that I just didn't see in myself." 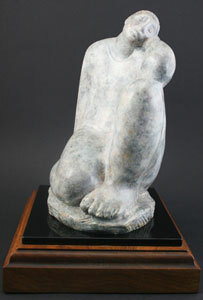 Shirley Thomson-Smith, Delona, Bronze Edition of 35, 11" x 2 " x 11"
Two years into college she married a man she'd known since high school, and the couple started raising children. Baking cookies and doing laundry replaced sculpting. But visions of pieces she wanted to make would come to her at all hours, whether she was watching TV or cooking dinner. When her three children started school, Smith enrolled in art classes. And once again, her teachers offered strong words of encouragement. "One teacher said, 'You ought to have five pieces going at one time as good as you are,'" she recalls. "I couldn't figure it out. I had to push myself to get back into it." In the early '70s, her husband's work took the family to Durango, the site of a Navajo medical center. As Smith watched the women coming in and out of the clinic, something awakened in her. 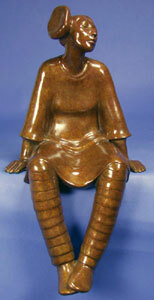 Shirley Thomson-Smith, Courtney, Bronze Edition of 35, 13"
"I was captivated by how quiet and stoic the Navajo women were," she says. "I identified with the way they walked behind wagons or sat behind men, with their subservience. They held themselves with dignity, and I could see a strength in them that I really appreciated." Shortly after that her marriage ended, and she was forced to find outside employment. When she walked off her secretarial job, she had no insurance and no real prospects. While doing odd jobs at a foundry and as a teacher, she labored long nights in her studio trying to make enough sculptures so a gallery would take her seriously. In retrospect, she says, it was the most productive period of her career, and it resulted in a bite from Michael Wigley, director of Quail Hollow Gallery in Oklahoma City. Still uncertain of the quality of her work, Smith was astonished and humbled by his interest. 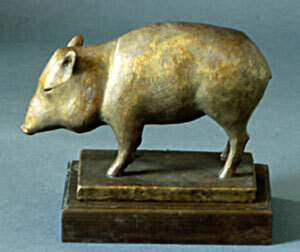 Shirley Thomson-Smith, Life's a Boar, Bronze Edition of 30, 11"
"I was so dedicated," she recalls. "When I look back I see what gave me the determination to do it. My husband wanted a divorce, and I got divorced. My mother didn't give me the support I wanted. It was almost like I thought, 'I'll show you all I can do it.'" Within a year, Smith's fervent promise to herself had come true. Galleries in Arizona, Kansas, and Texas had come on board, and word spread to Fenn Galleries in Santa Fe and Amado PeÒa Gallery in Taos, which also opted to represent her. By the early '80s, the artist remembers, she could live on the income that came from Santa Fe alone, and collectors were telling her they couldn't decide whether to buy her sculptures or those of the acclaimed Apache sculptor Allan Houser. It began to dawn on Smith that she might have talent. 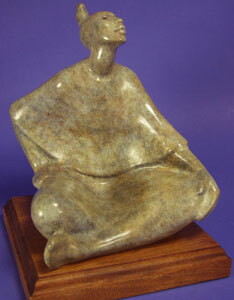 Shirley Thomson-Smith, Madaya, Bronze Edition of 35, 14" x 10" x 10"
Her early pieces were made of pressed clay, which the artist would push inside a clay mold. It was not a widely used process, in part because it was so labor-intensive, but Smith enjoyed sitting on the floor, holding the mold between her knees, and pressing the clay inside. When the pieces were removed, each one had to be individually finished. These were her bread-and-butter pieces and paid for the higher-priced bronzes she was also making. Smith purposely priced them at $500 and $1,000 so they would be affordable for most buyers. Her forte was, and still is, the female figure, smooth and curvaceous, inspired by the unashamedly robust women crafted by the late Costa Rican sculptor Francisco Z˙Òiga. 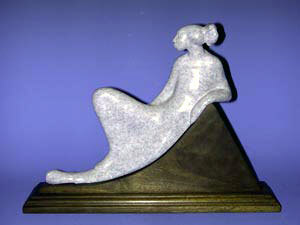 Shirley Thomson-Smith, Repose, Bronze Edition of 35, 10" x 8" x 6.5"
"Women are rounded and pretty, and I love the form. I don't like to do men because they're too muscled. I know and understand the female anatomy, but I don't know all the muscles in the male body and I don't really care to," Smith says with the kind of authority that only a woman who has paid her dues can get away with. As she has aged, Smith has come to prefer working in bronze because it is less physically demanding. She adds patinas to her pieces that resemble marble. Though female figures remain her favorite subject, she sometimes crafts animals-whimsical bears or elegant pelicans and penguins. Looking back, even now she's slightly amazed by the recognition her work has received, including a major retrospective at this year's Gilcrease Rendezvous at the Gilcrease Museum in Tulsa, OK. And she's also looking ahead, with plans to work until she dies, perhaps creating more monumental sculptures that allow her greater freedom than smaller pieces. Over the years, her work has grown more stylized and achieved a greater level of sophistication, but her basic impulse remains the same-to celebrate women, with all their flaws, in all their beauty and courage. Dottie Indyke writes the monthly Native Arts column. 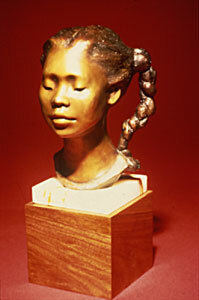 Shirley Thomson-Smith, Maria, Bronze Edition of 36, 18" x 9" x 10"